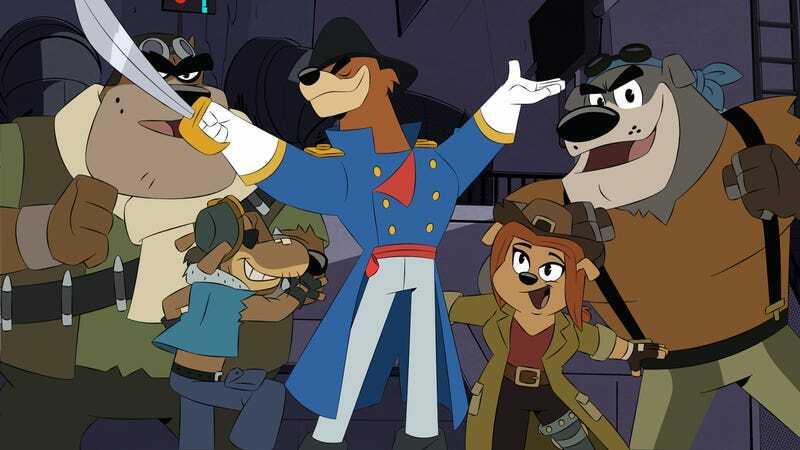 DuckTales has so far referenced Darkwing Duck and Gummi Bears in its current incarnation, and, outside of a quick reference to Cape Suzette in the pilot, finally looks to TaleSpin as another source to pull from (it would be interesting to see if they can reference Chip ‘N Dale: Rescue Rangers, but that may be a trickier feat to pull off). The band of aerial pirates that scourged the skies in that weird, but wonderful, Jungle Book 1930s knock-off show is brought back to terrorize the skies again, raiding Scrooge’s ship via an excellent, choreographed song-and-dance number, all lead by Don Karnage, arguably one of Disney’s best and underrated characters, ever. He was originally voiced by Jim Cummings, who nailed his Ricky Ricardo-inspired cadence with a perfect combination of overdramatic flair and raw, real menace. Jaime Camil (Jane The Virgin) was pegged to voice this incarnation, and while he doesn’t have Cummings’ honed-in vocal specificity, he does provide Karnage with his own unique brand of theatricality and cruelty. "Sky Pirates... In The Sky!" Despite the wonky set up, “Sky Pirates... In The Sky!” delivers a wildly entertaining, amusing episode by sheer will alone. Madison Bateman’s script goes for broke with an exciting musical-adventure that utilizes the show’s cartoonish-theatricality with comical villains that still manage to be real threats, and Matthew Humphreys’ direction is a pure delight, excelling at the various dance routines, aerial performances, and the final dangerous battle between Karnage and the various nephews impersonating Dewey. And Karnage himself is great, the musical pirate captain gloriously shining as the lead while also exposing his raw villainy as he casually tosses out a henchman who dares question his decisions. He also exhibits his trademark arrogant idiocy when he believes his disguise is good enough to fool Scrooge and the crew, but his commitment to it regardless is hilarious. It’s a tough thing–bridging arrogance, stupidity, cleverness, malevolence, and melodrama all in one character, and both versions of the Karnages do it swimmingly. 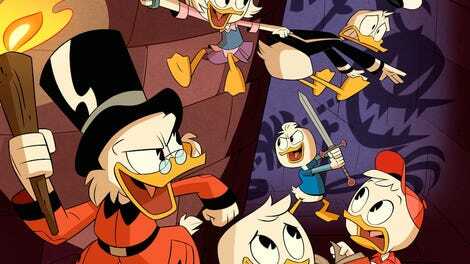 The specific plot points involve a role reversal of sorts, in which Dewey goes off alone to retrieve his hat (which was stolen along with the rest of Scrooge’s treasure), convinces the pirates to mutiny against Karnage, and becomes captain of the pirates themselves. I really like the implication that Karnage’s absolute control, cruelty, and desire for the spotlight was both an innate characterization and purposely done to maintain control of those pirates, whose individual desires, while admirable, can get out of hand. Also, they’re still pirates. It’s those fact, the pirates going overboard with their musical prowess outside of a leader’s control, that dooms the ship and allows the ducks to escape. “Sky Pirates... In The Sky!” isn’t a particularly character-rich episode–Karnage’s heart-to-heart with his crew is a heck of a lot more emotionally heartfelt than the one Dewey has with his family–but it makes up for it with a viciously fun episode with stakes, laughs, and songs. The B-plot, in which Louie tries to hide the fact that he held on to a magical jewel (which turned out to be not so magical), isn’t much, but it has an amazing joke where Louie “overpowers” his dark-desire side in the jewel with an even crazier, darker idea from himself and it’s arguably the funniest, most well-executed gag this show has done so far. I like that this referenced Dewey’s weird love for creating dance routines for various badguys, which he did back in “The Living Mummies of Toth-Ra.” Just say Dewey really likes musical theater, DuckTales. The part in the song where the various pirates introduce themselves did run a bit long but it was oddly sweet, allowing the bit players a moment to be more than bit players. I hope that summer intent goes places! “Davy Jones’ Upper Cabinet” is so stupid I absolutely love it.